The NMC/CoSN Horizon Report 2016 K-12 Edition reads like a state of the union for educational technology outlining key trends, significant challenges, and important developments in the field. Its evaluation of trends and developments as short-term (1 yr or less), mid-term (2-3 years), and long-term (4-5 years) are reasonably assessed. So too is categorizing challenges as solvable, difficult, and “wicked”. Much good information is included here. Organizing each trend into bite-sized pieces with a sort of preamble; Overview; Implications For Policy, Leadership or Practice; and then substantial For Further Reading offerings to further explore each subject. An element of professional practice that I’ve been wrestling with over the course of this year has to do with professional development for k-12 teachers. There is much to get excited about in this report and some trends are already underway. However, at the risk of injecting a cynical note into the discussion, I’m not sure how many of these trends will become embedded in American practice until we address professional learning. Through 47 pages of the NMC/CoSN report, professional development is mentioned 11 times. In fact, “Rethinking the Roles of Teachers” is a significant challenge addressed in the report as a “solvable challenge”, even if it is buried midway into the report and is the second of only two challenges the authors consider solvable. I would argue that no trend mentioned in this report can be implemented without significant professional learning for teachers and administrators alike. The dismal quality of much American k-12 PD, little budgetary support, and teacher attitudes towards it will all have significant impact on whether and which trends come to live in any given school or district. As such, professional learning and “Rethinking the Roles of Teachers” is the lens through which I will read this report. Of the trends outlined in the report, those I think will gain traction in the next five years include collaborative learning, students as creators, rethinking the roles of teachers, personalizing learning, and online learning. They are likely have the best chance of taking hold in American education if for no other reason than they fit within the current paradigm and do not require technology necessarily to provide powerful learning experiences. Collaborative learning, project- and problem-based learning, and personalized learning are already a part of teacher vocabulary. Online learning is gaining traction via flipped classrooms and blended learning. With this foot in the door, technology can be incorporated in ways that modify and redesign extant units and lessons. With some shifts to what they offer, professional learning providers deliver can accomplish such modification and redefinition of existing lessons and in the process realign teachers away from teacher-centered instruction and towards new roles as guides and facilitators. PD providers need to present learning such that teachers receive “hands-on experiences … to help integrate technology in the classroom [and] create agile environments that support the development of professional learning networks where educators can seek guidance and inspiration from peers and around the globe as they rethink their pedagogies and curricula” (p. 24). Through their own hands-on experiences, teachers learn as we want their students to learn in the digital age. With such experiences, teachers are more likely to transfer their experiences to their students. Back in their classrooms, then, teachers facilitate experiences that extend students’ collaborative learning out through digital networks, empower them as creators of content and not must consumers, teach them to recognize and pursue their own interests and learning goals, and do more and more of all these activities online. I predict that online learning will become a path to personalized learning not just for students, but for teachers too. I predict that over the next few years, teachers will figure out they can completely personalize PD, learn anytime/anywhere, at their own pace, and not have to contend with one-size-fits-all PD. I am especially excited about the prospects for digital badging. As it becomes increasingly popular, more and more educators will be able to extend their personalized, online learning even farther as they accumulate only the skills and content knowledge needed for their own specific professional learning needs. In fact, some states are already experimenting with digital badges as a way for teachers to maintain their credentials along side CPDU’s and potentially even in place of them. When these trends take off, online learning for both teacher learning and student learning will become de rigueur. All these changes will be good for schools, yes. But mostly, they will be a boon for students and learning. Young people are so disconnected from their school experiences right now. Many teachers teach for compliance and completion because such work is easy to grade and translates into easy measurables like GPA’s and graduation rates. But completion and good grades do not equal learning. And compliance and completion methods are mostly divorced from the kinds of social learning young people are used to doing with and without their networked devices when they are not in school. Perhaps one of the biggest challenges to getting more technology-based methods in the classroom is getting teachers to see themselves as facilitators and not experts. The image of themselves as experts keeps many teachers from trying things they don’t think they know well enough to teach. This is especially so with technology given how vast a landscape it is and how constantly and rapidly it changes. Prior to the digital age, it was a little easier to operate with the expert mindset. But the internet age has given us access to the sum of human knowledge and there is no way anyone can know all of it. The mobile age has given us a multiplicity of ways to access that knowledge and ways that are persistent. There is no way to be expert in all affordances either. In a blog post for a previous class I wrote about this very subject. Once we can get to this point as a profession — where teachers shed their self-perceptions as experts and dive deep into their “one particular corner” of the internet or social media to feel “comfy” with it — then many more of these trends stand a chance of sticking. Then school will again be a place of interest and joy for our students and not a drill and kill testing mill. Another significant shift needs to occur around what kind of PD is prioritized. For any of these trends to become a meaningful part of teaching and learning, teachers need to seek more learning about how to incorporate the broad concepts each of these trends represents and how technology plays a role in each. They need far less PD that is merely training for specific apps. Indeed, teachers already in the classroom will need quite a bit of focused, long-term learning so they can become “guides and mentors, modeling responsible global citizenship and motivating students to adopt lifelong learning habits by providing opportunities for students to direct their own learning trajectories” (p. 24). If administrators and teachers prioritize professional learning to focus on a limited set of student-centered outcomes that map to and differentiate for teacher learning needs, then these trends have a chance of taking root. The extent to which schools sustain limited PD over time and partner with PD providers who deliver quality learning experiences will also impact success. But where professional learning is piecemeal, random, low-quality, one-off, and conference-based, I don’t see any of the trends in the report taking root in any consistent way that is beneficial for all learners. Our readings this week focused was on Digital citizenship, access, and policy. A shift, but one that turned out to be fruitful in terms of getting me to think about more nuts and bolts of ICT implementation, teaching and coaching. The more I read and the more I experience as a student in this grad program, the more I believe the path to better access for students runs through teachers having direct ICT learning experiences themselves. District and school policies, administrator attitudes and priorities, and parent fears and misconceptions all hold their various concerns and possible obstacles. However, the critical juncture ultimately is the teacher who either understands the need for students to have connected learning experiences or does not. For those that do understand, they do all they can to provide those experiences. Continued support and professional learning about is, of course, vital, given the dynamic and ever-changing nature of the internet. However, for those “reluctant” or “traditional” teachers, their understanding needs to be developed. With new knowledge and continued support ought to come a change in instructional behaviors. Most teachers want to do good by their students. But they also feel the need to be experts in their classrooms. So if we provide teachers with their own professional learning experiences that ask them to practice the 4 C’s as learners, they will likely recognize the power of such learning experiences and want to provide the same for their students. In so doing, students have increased, and hopefully better, access. It was 2009 when last I had my own classroom. Looking back to that time is instructive given how much has changed in the ensuing 8 years. Our use policy was an AUP since the notion of an RUP didn’t exist yet. Or if it did, no one at our school was privvy to the concept. Students and parents had to sign a form acknowledging that they read, understood and would abide by its terms as well as any consequences for their breach. Additionally, students had to pass a mandatory multiple choice quiz about the AUP’s content with a grade of 80% or better in order to gain access to the school network. (They could take it as many times as they needed to attain the minimum score.) But as Rethinking Acceptable Use Policies to Enable Digital Learning describes it, “[r]equiring students to sign a document indicating they will comply with the district policies may or may not mean that they understand and accept the commitment they are making. A ‘sign off’ could be as casual and thoughtless as the way people sometimes place a check in the accept box on applications or software ‘terms and conditions. '” The quiz was meant for students to do more than merely sign off; but looking back, I don’t think it was significantly more than that. While the large majority of students passed the quiz on the first try, I would surmise that most of them were going for short-term cramming more than long-term understanding. Designing an RUP and the on-boarding process around it today, I would definitely include student voice in its development and some kind of course work to deepen their understanding by applying it in real contexts. Again, going back to 2009, I can see that I definitely focused on what students should not do with technology. That included everything from using the CD drives to play advisory-labeled music, to looking at web sites they shouldn’t be on, to playing games or designing gym shoes instead of doing assignments. (Looking back now, I should have leveraged the creative aspects of those last two examples. But what did I know?) To be fair, though, I was also giving assignments that usually hovered around the substitution level of SAMR and occasionally at the augmentation level. So it’s not likely they saw why doing the work on a computer necessarily mattered to their learning. In other words, their behaviors were, in part, a sign of boredom or low relevance. At the time, we used eChalk, which was as close to an LMS as we got in 2009. Every student account included an email address. So the kinds of citizenship behaviors students demonstrated on a computer were a bit more limited. However, cell phones were another matter. None of my students could afford smartphones, so the most distracting thing they could do with their phones during school was text friends and family. And text they did. Sexting became an issue. At times, fights both in and out of school, would erupt as a result of texting drama. In one instance, we even had parents drawn into texting drama between their children come to the school midday prepared to fight each other. Unfortunately, our reactions in the face of these events were all punitive and centered around confiscating cell phones if they were visible during the school day and then requiring parents to come to the school to pick them up. Repeat “offenders” would get detention. Thus, to my way of thinking, we need to mediate the flaws, yes. But we cannot let the flaws completely define how we use the web such that they impede our using it for all the great things we can do online. This text was very useful in helping me reframe my thinking, shifting from AUP’s to RUP’s in the Web 2.0 era. It informs much of my discussion content today. Can You Teach Digital Citizenship, If You are not an Active Digital Citizen Yourself? What I liked most about this blog was not only examining ones digital footprint and how to create a positive one, but I particularly like the idea of improving one’s digital footprint. When it comes to thinking about our digital footprint, we more often focus on the tattoo aspect in that once you put something into the digital world it’s out there permanently since we can’t control what remains on, say, Google’s servers, or what other people might download and save from our posts. And that’s a lesson that any Internaut needs to understand at the deepest level. However, we can in fact scrub our identities on sites like Facebook, Instagram, Snapchat, etc. by going through and deleting elements that might not fit with the online persona we wish to present once we have a better understanding of digital citizenship. This is definitely a surface scrub given that we will never know what is saved at deeper levels of cyberspace. However appearances matter. At least anyone who would be looking to manipulate or make judgments about us based on our digital presence would have to work harder to find that ill-considered material as opposed to simply finding it right there on our public social media feeds. This week’s readings definitely touched on some of the policy matters surrounding the use of ed tech. Not our usual fare in class so far. But that shift toward the practical and legal matters was an interesting shift to get us thinking about a different perspective in regard to this work. It was also instructive for me to compare where we were 8 years ago and how the times and tech require a rethinking about the policies we put in place and how to roll those out to teachers, parents, and of course, our students. 1) What do you think of EdSurge? Beyond randomly finding an article or blog post with an EdSurge URL, I’m not that familiar with the site. Since Mary Jo Madda’s webinar appearance I’ve spent some time browsing the site. In general, I’d say it looks like a useful clearinghouse of information. Their Product Index is an elegantly organized resource and provides a succinct breakdown of each product. Actual user reviews make this particularly useful through both the Case Studies and Summit Reviews. Providing teacher voice as a professional word of mouth — an educational Yelp, if you will — takes some of the uncertainty out of purchasing or usage decisions for unknown, untried products. The one area that I’m skeptical about and will need to spend more time on is the Research section. When Pearson and AT&T Aspire logos are so prominently displayed as funders, red flags go up and the page feels rather advertorial. Still the Bill and Melinda Gates Foundation and the Nellie Mae Education Foundation are funders as well, if one reads the mouse print. 2) Did you learn about any new tools from Mary Jo? If so, which ones? Most of Mary Jo’s talk seemed more general and was a confirmation or reiteration of much of the research I’ve read thus far in my studies at NLU. Mainly that in many cases, technology isn’t changing the look and feel of classrooms. As she put it, students are still sitting at desks in forward-facing rows looking at a teacher, work is not student centered, and tech is “sprinkled” into instruction as an add-on. She added what the research bears out, namely that this is the case with even many tech savvy teachers. That said, she did mention a few resource I would like to explore: Global Nomads, Everfy, Remind, and particularly the 50 States Project. 3) Any other takeaways from Mary Jo’s portion of the webinar? Repeat the cycle with the refinements. Then allow the learning from that process to be leveraged by the next cohort through some kind of mentorship or guided practice from more knowledgable others who learned it first. Both these takeaways are just basic and essential sustainability practices. 4) What do you think of Chris Hull’s “teachpreneur” story? I have to acknowledge a bias at this point. The advent of the digital age and the democratization of and explosion of creativity it has facilitated all through society is an incredibly good thing. However, I am turned off by two notions that seem to have sprung up along with this creativity, particularly in our consumerist-capitalist society. The first is that this explosion of creativity should be monetized where it can be. The second is that once we have discovered our creative idea, we must leverage it to become entrepreneurs, essentially leaving behind the work we were doing that led to the creative discovery in the first place. And we should not just be entrepreneurs; but entrepreneurial “disrupters” of the status quo. Inasmuch as this pertains to education, ours is a profession that has been beset by snake oil salespeople for decades. So my bias is that I am highly skeptical of yet another way to sell educators on new, tech-based products, most of which are usually marketed as “the last xyz product or platform you will ever need because it does everything educators need to do in one convenient package.” To paraphrase Chris, I am wary of the “shiny-shiny” effect of new educational technology. That said, Chris stands out as the rarer example in that he has, so far, stayed in the classroom even as he’s entreprenant. This gives him a bit more credibility. His product grows out of his experiences as a working teacher and is not some corporate or academic software designer making products he thinks teachers and students need. 5) Have you ever come up with an idea related to ed tech that you might like to develop? No. I tend to work better along the lines of finding ways to extend the use of tools others have developed beyond their intended use or to use them in innovative ways. It’s taken 7 years of independent consulting, but I’ve learned that I am not entrepreneurial or a “teacherpreneur”. While there are elements of being my own boss I’ve enjoyed, I’ve found I work much better as part of a single school community, with all members working towards the same mission. I don’t think I would want to “dilute” that work. And as I stated above, I resist this whole notion of everyone having to be an entrepreneur. I do not like how that moniker and type of activity have been elevated as some kind of ideal we all should be shooting for no matter our profession. It feels as if you’re not really contributing if you’re not “disrupting” or being “entrepreneurial” and making money from it. We still need individuals who are dedicated and focused on the science and craft of education (or insert-profession-here since entrepreneurship is now applicable to any profession). 6) Check out Otus. What do you like or not like about this platform? Otus looks to be another tool that efficiently and effectively allows teachers to see all kinds of data about their students. It also seems to allow for quick differentiation (once lessons and assessments are created/input) in terms of what lessons and assessments are assigned to what students. Teachers can then spend more time talking, analyzing, evaluating, and thus making decisions about next steps regarding their own performance as well as their students’. They don’t have to spend all their time searching for data and aggregating it. While this kind of data can be useful, it is only one kind of evidence about how well teachers are teaching and how well students are learning. It is only one type of snapshot in an album of evidence that tells the story of student learning and growth over time. I would like to see the tool also store and pull up actual student artifacts as easily as it does data points. Looking at student work — not just final grades or completed assessments — and having discussions about what that work reveals about teaching and learning provides far more detailed insights into student understanding, misunderstanding and confusion than looking at scores alone. Scores show trends. Work products show details and nuance about the state of student growth. Being able to quickly select and aggregate said products as easily as scores and statistics would make this platform truly unique. Since research bears out that what teachers use technology for most is communication, student management, and administrative work, I’m wondering how disruptive Otus really is. Perhaps if there were more functions that facilitated teachers’ use of ICT instructional tools? (And perhaps there are, I don’t know as I’ve only just learned about Otus two days ago.) But then again, if you try to make any one tool all things to all people, it winds up doing nothing very well. Perhaps it is sufficient that it appears simply to be a quality tool for teachers to do what they usually do with technology. SAMR has been useful in my coaching in two ways. I look for opportunities to stretch my coachees into at least augmentation or modification. 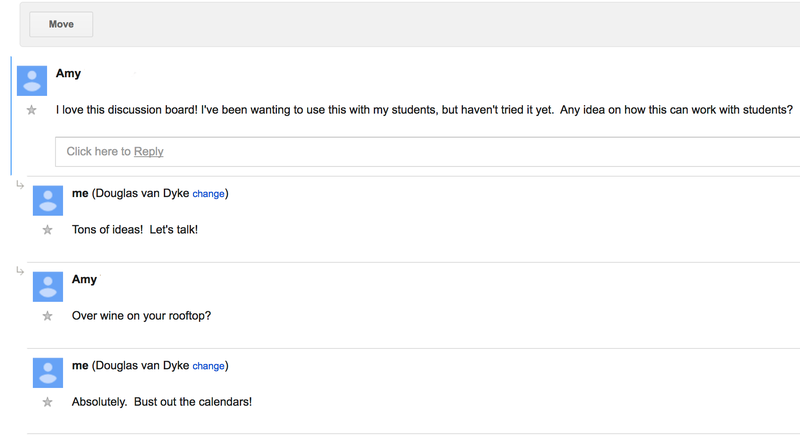 For instance, I recently set up a discussion board in Google Groups for an ILT I work with to extend faculty conversations around learning walks beyond teachers’ physical time together. Granted, it’s not a lot compared to what we’ve been using in our NLU course work. But even for my teachers who want to embrace technology, it’s an ah-ha since they don’t venture too far down the GAFE paths they have available to them. They are easily overwhelmed and quickly become anxious when asked to use features outside their workflow in programs they use everyday. In general, they struggle with their own ability to transfer skills from a known program to a new one. In another school I’m helping the faculty map their curriculum using Google Docs to collaboratively write their maps, collect resources, and view each other’s maps. This is the first that they have effectively been able to visualize the curriculum as a whole. However, teachers have struggled to find enough time to meet to work collaboratively on course team maps. CPS’s turning PD days into furlough days has only exacerbated the issue. While many see the value of the project, they are tired of fighting to carve out tiny parcels of time to meet and do the work. So just last week I proposed they stop trying to meet face-to-face as it was less necessary than they thought given the powerful collaboration tools that already exist in Google Docs if only they would use them. In my instructional work I’ve brought SAMR to planning meetings and coached teachers through using the framework to analyze and evaluate their current technology. Many are surprised to see that they’re operating mostly at the substitution level with occasional dips into augmentation. We all get excited when the conversation then turns creative and the teacher starts visualizing ways to redesign a lesson such that those iPads or Chromebooks are being used for modification or redefinition. 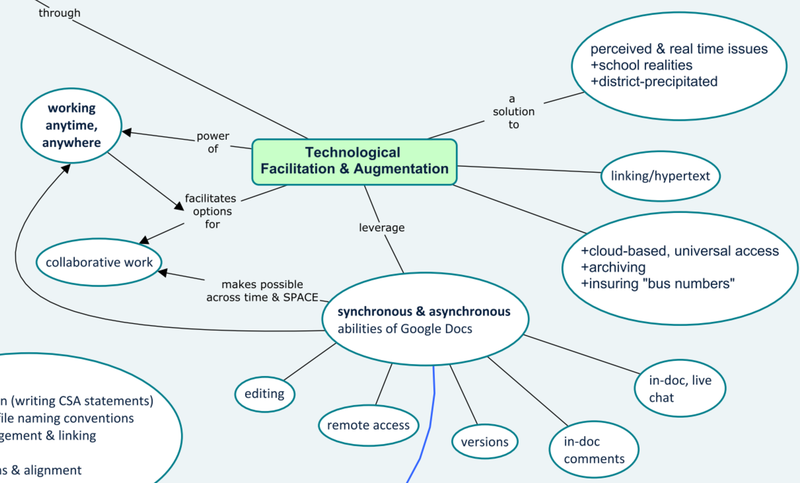 SAMR was an epiphany when I first encountered it. But having these other analytical and evaluative tools for ICT integration feels like revelation. TPACK, 3E, TIM are all new to me and I can see each having its place. 3E and SAMR seem more entry-level frameworks for teachers just starting to wrestle with ICT integration. They are relatively simple and straightforward. Given their complexity, however, TPACK and TIM seem to be for more sophisticated evaluation of technology deployment. The pedagogue in me appreciates how TPACK operates from the interplay among multiple domains and context. TPACK acknowledges the complexity and locality of teaching and learning and demands that the teacher does as well. TIM reminded me less of a rubric than of a continuum of skill development like something along the lines of a practitioner model of professional growth such as the Dreyfus model. Such models allow practitioners to position themselves on the continuum with the skill sets they currently possess. This creates an evaluative environment, but with less judgment and critique since the model honors practitioners at their current level of experience. It also suggests that their place in the model is dynamic. The longer they practice the more skills or “tools” they acquire. As they grow in experience they travel along the continuum. Such implicit messaging can be powerful for teachers working to improve their practice. There is an implied level of safety which is an important motivator for growth. Kids are savvy enough to know when an iPad or laptop activity is engaging them cognitively or when it is just a glorified textbook. We’re not pulling anything over on them by simply putting a device in their hands. These frameworks are great tools to level up our “teaching with tech” game. They not only foster teacher reflection about how effectively they teach with technology, but having multiple frameworks allows us to differentiate for the sophistication of the teacher using them.